Solar O & Irwin A (2007). 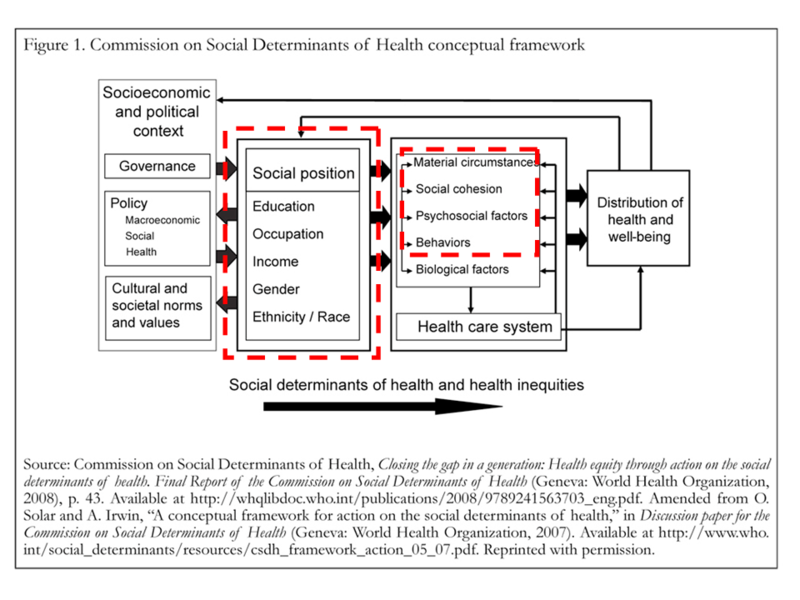 A conceptual framework for action on the social determinants of health. Discussion paper for the Commission on Social Determinants of Health. Geneva, World Health Organization. Commission on Social Determinants of Health. (2008). Closing the gap in a generation: health equity through action on the social determinants of health. Final report of the Commission on Social Determinants of Health. Geneva, World Health Organization. Marmot M et al. (2010). Interim first report on social determinants of health and the health divide in the WHO European Region. Copenhagen, WHO Regional Office for Europe. Marmot M et al. (2011). Interim second report on social determinants of health and the health divide in the WHO European Region. Copenhagen, WHO Regional Office for Europe. Jan van Dijk and Ken Hacker (2003). The ‘Digital Divide’ as a Complex and Dynamic Phenomenon. The Information Society. Vol. 19, Nr. 4, 315-326. Jan van Dijk (2005).The Deepening Divide, Inequality in the Information Society. Thousand Oaks, London, New Delhi: Sage, 240 p.
In a recent presentation about Health and Web 2.0 I tried to match both frameworks and I have posted about Inverse care law 2.0 several times using different scientific and statistical sources. It is worth pointing out (and obviously reasonable) that I have not found any references or mentions to ICT for Health in the literature about social determinants of Health gathered through Marmot Review team website. 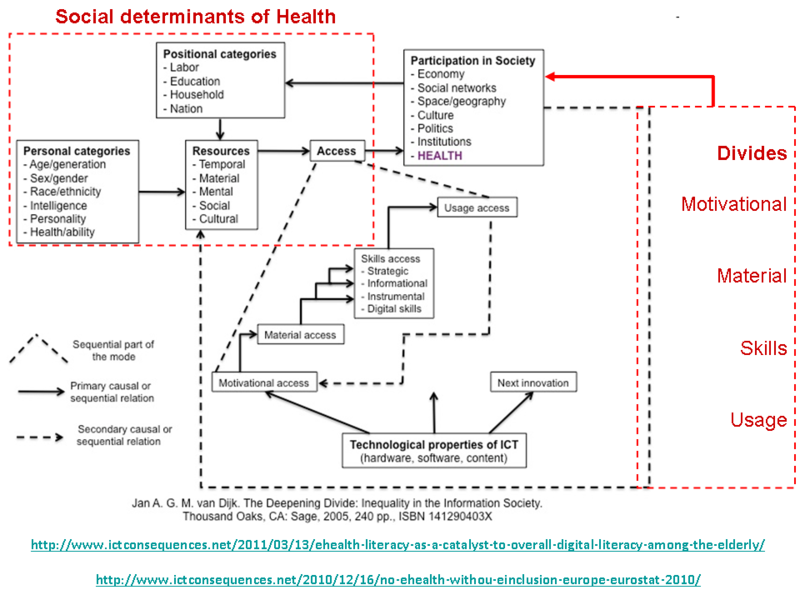 However, both frameworks (see red boxes in both figures) mention individual and social characteristics as social determinants of health and of the Internet usage. Furthermore, van Dijk includes HEALTH and ABILITY as a personal category (and I have added Health as a sphere of participation in Society and emphasis the Divides). 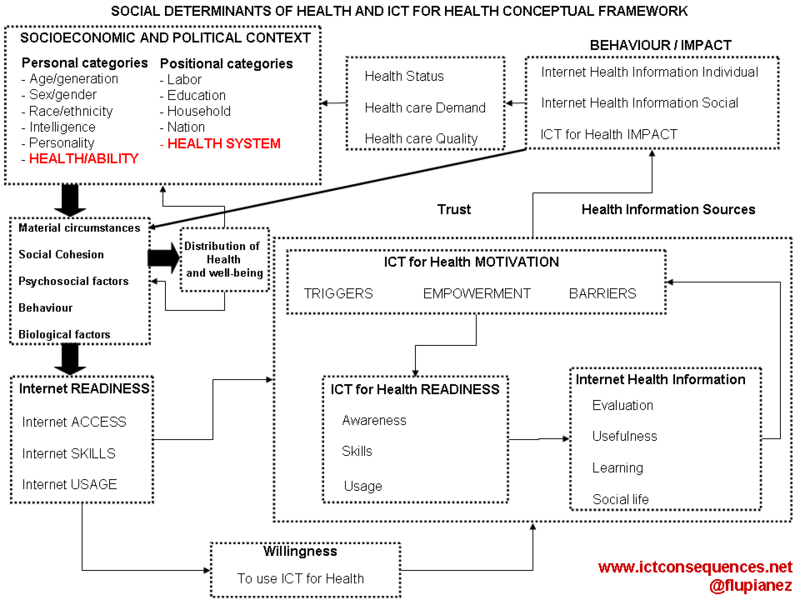 Based on and inspired by this two frameworks I have developed Social determinants of Health and ICT for Health (eHealth) conceptual framework. All concepts and boxes of this framework are based on scientific references and the relationships established by arrows have been empirical or theoretical driven. I’m currently working on it, however I have shared this framework to gather inputs to improve it. I would love to know your comments and ideas. Posted November 9, 2011 by Francisco Lupianez-Villanueva & filed under Chronic Disease, Citizens, eGovernment, eHealth, Health, Health Communication, Healthcare Organizations, Healthcare Systems, Hospitals, ICT, Internet, Network Society, Nurses, Patients, Pharmacist, Physicians, Policy and Legal aspects, Prevention, Research, Resources, Services, Telemedicine, Telemonitoring, Theory, Web 2.0.